Special Thanks to Co-Author: Genesis Ferrer. In 1917, American citizenship was given or enforced upon Puerto Rico after becoming a United States colony. This was one of the doors that opened way to a large percent of Puerto Rican migration to the mainland US. However, different population census show that it wasn’t until 1945 that actual migration took place. The major drift happened from the late 1950’s until the early 1970’s, when, according to the New York’s 1966 Census, there was a peak of more than 1 million Puerto Rican natives in the state. Nevertheless, it is important to note that human migration is a natural phenomenon, which has been practiced in human evolution since the first Australopithecus Afarensis. The citizens of the island didn’t move based on impulse, but because the economical and political situations on the island forced them to search for better living conditions. After the Second World War, Puerto Rico was an agriculture-based society that struggled with high unemployment rates and extreme poverty. The years that led up to the peak of migration highly influenced the resident’s choice to move. Puerto Ricans would constantly compare the industrial development of the post war “boom” happening in the United States’s economy with the fight for equal rights that happened during the insurrection of the nationalist revolution in the 1950’s. In other words, they were visualizing their “low class” citizenship in Puerto Rico and comparing it to the contemporary social development in the U. S.
As the economy of Puerto Rico shifted from agriculture to industry, Operation Bootstrap included provisions for farm workers to be transported from Puerto Rico to American farms. Many went in search of the “American Dream”, an idea based on a high and stable income, better education for their children and even a bigger house for them to live in. A lot of residents left with the idea of making money to one day come back to Puerto Rico and help their families. Many had to face a cultural clash, language barriers and rampant racism. However, migration didn’t just occur in the 1960’s. History repeats itself. In September 2017, the unsuspecting Puerto Rican public faced an unprecedented atmospheric event. Hurricane Maria caught the island off-guard and vulnerable. Thousands lost their lives. Yet, their tragedies were hidden from the world for months. Food, water and gasoline were scarce during the first weeks after the hurricane and for those in the mountainous areas of the island, survival became a dim hope. The total collapse of communication caused an island-wide panic. Family members were desperately trying to find their loved ones and make sure they had survived the onslaught. Nothing could have prepared Puerto Ricans for the difficult months to come. After the hurricane passed, 80% of Puerto Rico’s power grid collapsed. This was described as the largest blackout in U.S. history. Over 3.4 million American citizens were left in the dark. In times of great stress, our human instinct is simply to survive. It is precisely this instinct that motivated as many as 500,000 Puerto Ricans to leave for the mainland within the last decade. Our government estimates that by the end of 2018, 200,000 more will join them. What has brought upon this exodus? The main culprit is surprisingly not Hurricane Maria. The years of government corruption, inefficacy and mishandling of funds have left a void in Puerto Rico’s infrastructure. It is that void that has prompted thousands to pack their bags, forcing them to leave their homes behind in search of a better tomorrow, much like their ancestors did in the 1960s. Hurricane Maria simply exposed what many had suspected for years. It is natural for humans to migrate. We have done it since our species began to roam the Earth. However, thanks to our capitalist society, emigration will have serious consequences for our island. As economist José Joaquín Villamil said: “Economic predictions depend on good population statistics.” As more Puerto Ricans abandon the island, our economy will only continue to worsen. Where are the migrants going? Most have left for the mainland United States, and some settled in places as far as Hawaii and Alaska. Puerto Ricans are Americans. Our migration to the mainland United States makes sense. However, not many see it that way. As Puerto Rican populations living in the U.S. increased after Hurricane Maria, so did the racial discrimination. Racial discrimination has been integral to Puerto Rico’s colonial history with the United States. We still see consequences of this today. As many as 50% of mainland U.S. citizens have said to be unaware that Puerto Ricans were U.S. citizens as well. Needless to say, Hurricane Maria has continued its impact on the lives of Puerto Ricans everywhere. Those living in the island were confronted with possibly the biggest challenge of their lives. Over a year after Maria, many continue to migrate. 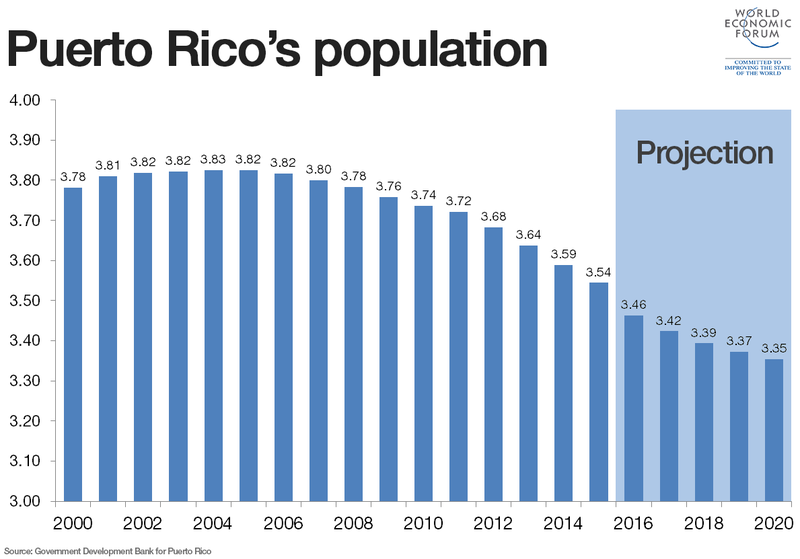 However, there is a silver lining to this Puerto Rican exodus. While living in the island, Puerto Ricans can only vote in primaries. Meanwhile, those living in the mainland can vote like any other American citizen. Some analysts believe that the large exodus of Puerto Ricans might have a significant impact on the next presidential elections. A new, Florida-based, non-profit organization named “Boricua Vota” aims to increase the amount of Puerto Rican voters. Their hope is that those in the mainland may use their voting rights to help those left in the island. Perhaps we will finally be the force of change our world desperately needs.